This superb English Art Nouveau building on Daisy Bank Road in Victoria Park, from Manchester architect, Edgar Wood, was the first purpose-built church in Britain for Christian Scientists. 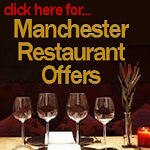 Built between 1902 and 1906 it was recognised as one of the finest new buildings in Europe. The church was closed however on Boxing Day 1971 and vandals looted most of its contents. 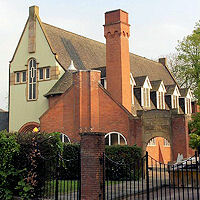 The fate of the church hung in the balance for a while, until it was bought by the council who restored it successfully as The Edgar Wood Centre. Superb! 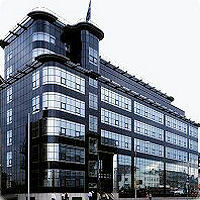 Sir Owen Williams impressive 1939 glass building on Great Ancoats Street in the Northern Quarter was a copy of its sister building on Fleet Street, London, without the Art Deco motivs. Originally, you could stand on the street outside and watch the workers inside producing the Daily Express on the massive printing press. 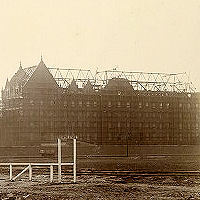 Now converted into offices and apartments, with many features removed. 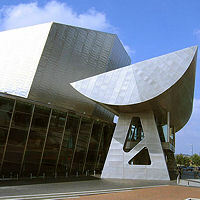 The amazing Lowry theatre and art gallery, is set in a waterside location in the redeveloped Salford Quays. Opened on the 28th April 2000, the impressive glass and metallic structure is a far cry from the 'dark satanic mills' painted by Salford's favourite son, LS Lowry, whom the building is named after. An impressive footbridge joins The Lowry with the Imperial War Museum and Old Trafford football stadium on the opposite bank of the Manchester Ship Canal. One of the few popular designs from Manchester's Ian Simpson Architects, Urbis is a new museum rising (and rising and rising) from the area devastated by the 1996 IRA bomb in Cathedral Gardens. It's a stunning building from all angles and offers views, largely obstructed by the frosted galss, of the city (or the horrible air vents on the rooftops at least). Opened in 2002, the glass building is a refreshing entrant to the architect's somewhat chequered portfolio of recent Manchester developments. 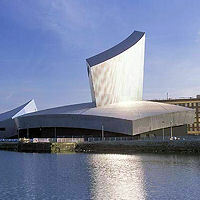 The impressive Imperial War Museum North, just across the footbridge from the Lowry, was the first building in the UK by architect Daniel Libeskind. Clad in aluminum, this amazing building on the banks of the Manchester Ship Canal offers a superb view of the city centre from half way up its 55 metre high tower. Built in 2000. 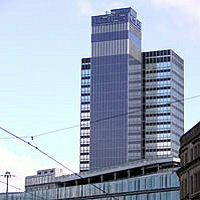 It has to be said that not many decent buildings cropped up in Manchester during the sixties and seventies. The CIS Building at the end of Balloon Street is an exception. Designed in 1962 by US firm, Skidmore Owens & Merrill, the two asymmetrically balanced towers remained the tallest in the city untl the Beetham Tower came along 44 years later in 2006. 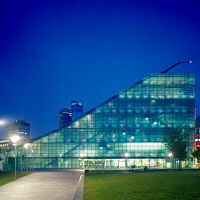 During the same year, the CIS Building was clad in Europe's largest commercial solar façade and renamed the CIS Solar Tower. Trafford Council's attempts to save one of the region's most historic buildings in 2003 failed because the government didn't think the 100 year old structure was architecturally important enough to warrant listed status. As a result, the wonderful building that housed engineering giants Metropolitan Vickers, was heartbreakingly bulldozed to make way for the Electric Park industrial estate. The American Westinghouse Company, which gave the building (and road) its name in 1901, moved to Trafford Park where they soon became a centre of engineering excellence, supplying the world with heavy steel turbines and equipment for traction engines and power stations. 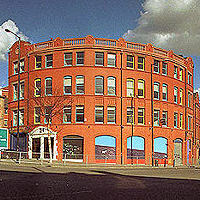 During the war, when Metropolitan Vickers was based in the building, the business played a crucial role in the building of the Manchester and Lancaster bombers. Vital research into the development of radar was also carried out there. Another beautiful historic building destroyed by civil servants. 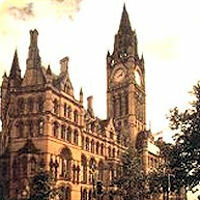 Manchester can safely boast one of the best town hall's in the whole world. 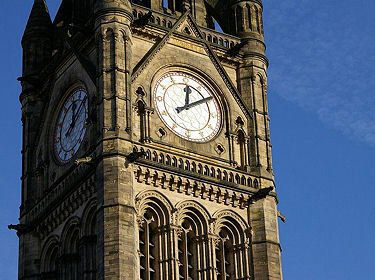 Designed in 1877 by Liverpool-born Alfred Waterhouse, the building stands on a triangular site with the Albert Square facing frontage being the longest and most impressive. The left hand corner is a major feature, and features several stone statues. The skyline needs to be seen at a distance to be appreciated, as from Albert Square the sheer size of the building makes it difficult to see the various roofs, turrets and chimneys. If you get chance, pop inside to see the stunning Ford Maddox Brown mural's capturing the early history of the city. 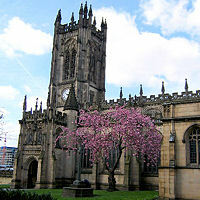 Whilst the first recorded history of the Cathedral and Collegiate Church of St Mary, St Denys and St George in Manchester dates back to 1421, its possible it was built long before. Unfortunately its location in the medieval centre of Manchester has left it isolated on the edge of the modern city centre, although the rebuilding after the 1996 IRA bomb has seen new gardens and walkways bringing it back into the fold. Although the Cathedral is the most significant surviving medieval building in the region, the external appearance is more recent; the tower built in 1867 and the west porch in 1898. The Cathedral is perhaps more impressive on the inside - impressive stained glass windows are complimented with wooden carvings which include pigs playing bagpipes and rabbits cooking hunters.